Releasing silver flies in Taughannock Falls State Park with students from the FORCES program. Biocontrol season is upon us here at the Whitmore Lab. Due to the short life span of Leucopis spp. silver flies, it is critical that they are released as soon as possible to ensure that most of them make it to their respective hemlock branches. The process can be a bit touch-and-go, and during this time of year our field team must be prepared for releases whenever flies are ready. 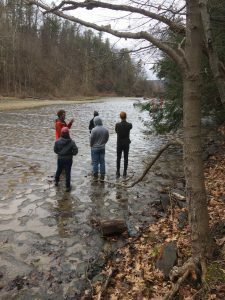 This week we released in two locations: locally at Taughannock Falls State Park in Trumansburg and Gosnell’s Big Woods Preserve in Webster. Wednesday afternoon we had 130 flies packed in 13 vials in a small cooler, flitting around just itching to be released. Each vial of 10 flies contains five females and five males in the hopes that they will mate and the next generation’s larvae will feed on the eggs of hemlock woolly adelgid. To release silver flies we secure a thin-screened bag with a long side zipper onto a well-infested hemlock branch and gently shake a vial of flies into the bag. Once the flies are inside, we zip up the side of the bag and leave the flies to their business. At Taughannock Falls State Park we set up thirteen bags on ten trees along the Gorge Trail, an effort that will supplement last year’s silver fly releases. 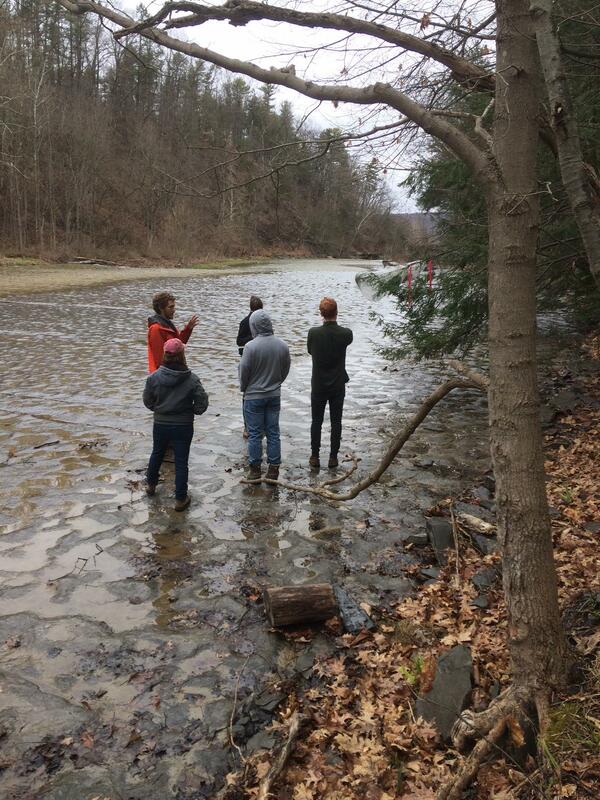 In addition to setting up these release sites, we also got some face-time with students from New York State Parks’ FORCES (Friends Of Recreation, Conservation, and Environmental Stewardship) program, giving them an up close and personal glimpse into the New York State Hemlock Initiative biocontrol program. 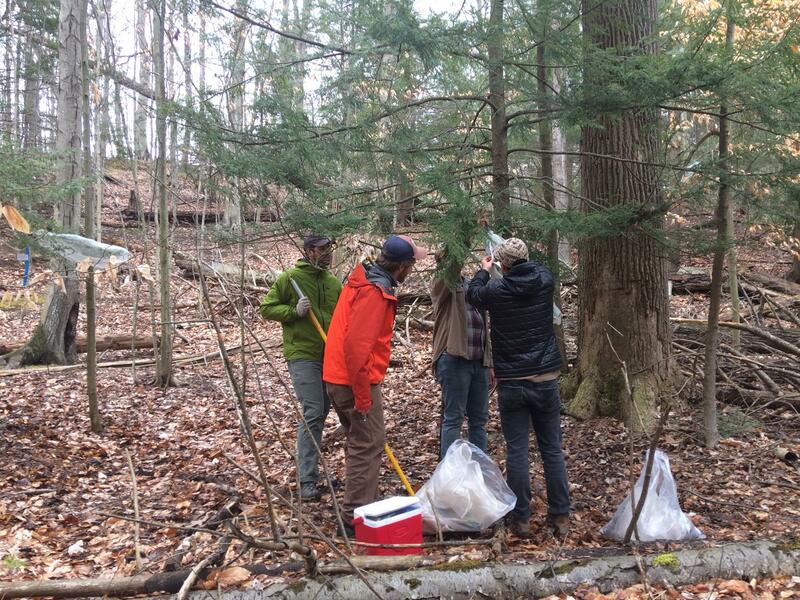 Many hands makes light work: our field team, along with Kevin Farrell from Genessee Land Trust, attempting to place a bag on a higher branch. On Thursday we were up in Webster at Gosnell’s Big Woods Preserve, a site that not only has beautiful hemlock stands, but also features giant old-growth trees the likes of which are rare in East Coast forests today. While we admired the enormous oaks and monstrous maples, our main focus was on the hemlocks, many of which are infested with HWA. 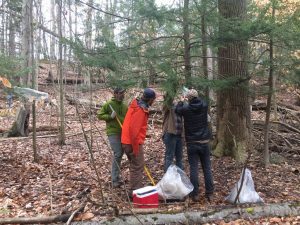 Aided by Genessee Land Trust’s Kevin Farrell, the Hemlock Initiative field team released a total of 150 flies on 11 trees at Gosnell’s Big Woods. This release marks the first at this particular site, but it is our hope that biocontrol releases here will help preserve the forests of the Lake Ontario plain. If you were worried that we are running low on flies this year, never fear. Mark is back in the Pacific Northwest this month collecting even more foliage for us. Our releases will continue throughout the month of May, so be sure to stay tuned for more biocontrol updates.